Once you've decided which reports you require, you must then determine when you want the reports to be generated. Typical examples might be an annual report of average response times, a monthly report of CPU usage, a weekly report of library growth, and so on. Now you've decided which reports you require and when you want them generated, you must decide in which format you'd like to see the data. Print The graph is printed. Bitmap The graph is output to a bitmap (.bmp) file. Windows meta file The graph is output to a Windows metafile (.wmf) file. JPEG The graph is output to a JPEG (.jpg) file. 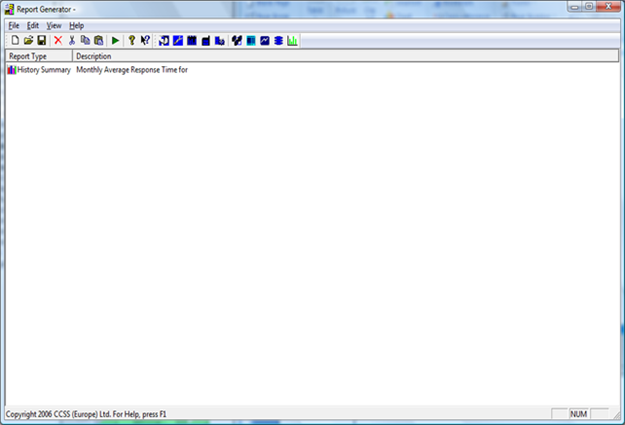 CSV The data is output to a file in comma separated variable format. 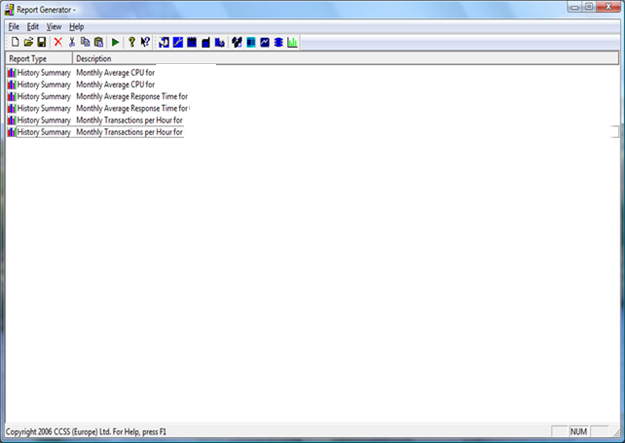 Tabbed text The data is output to a file in tabbed format. In the following example, we've decided that we'd like to see the average CPU, RSP and TRN figures for two systems on a monthly basis. This data is to be reflected in a graphical JPG format. The first thing we need to do is open the Report Generator module and then the History Summary module for the first system. Then, drill down to the data as we'd expect to see it. We've decided that we'd like the output in JPEG format, so select JPEG. You're asked where to save the file. Enter the file name and click OK. Select a date in the calendar to ensure that you get the required date calculations in the Date Formula field. 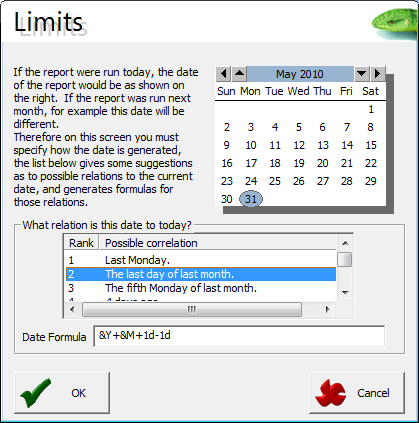 Experiment by changing the date in the calendar to see what effect it has on the formula. 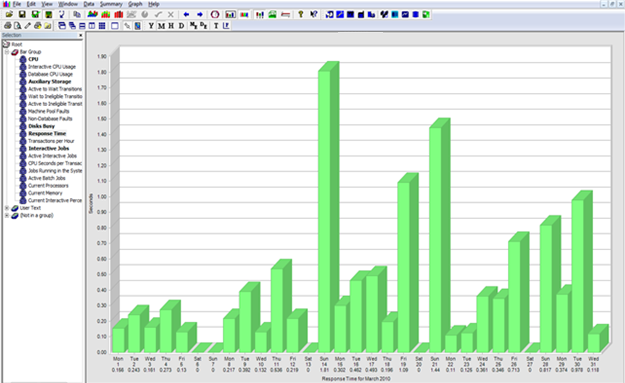 In this example, we always want the previous month’s report, so select the option for "The last day of the month." This gives us the date calculation formula. Whenever we run the report, it will always produce data as if it were being run on the last day of last month. So, we now have a file holding six records, each of which generates a JPEG file of our monthly requirements. Click File, then Save As and choose an appropriate name for the file. 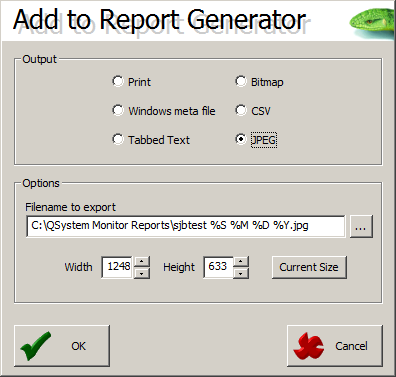 To run the file, open the Report Generator module, open the file, and click the green triangle icon. 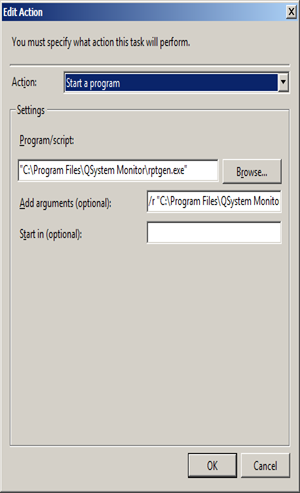 Or, you can add the file to your PC scheduler so that the report runs automatically. 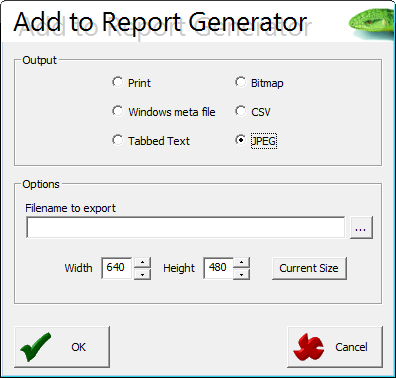 Reports that are created in Report Generator can be added to Windows as a task. 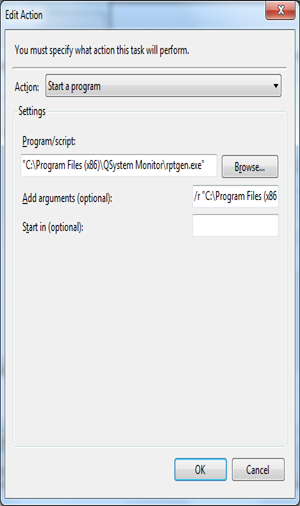 Below are examples of setting up the task in Windows Vista and Windows 7. 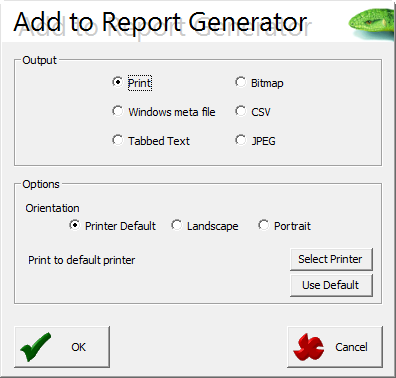 Use the parameter, Program/script, to run the Report Generator, and the parameter, Add arguments, to specify which Report Generator report to run. 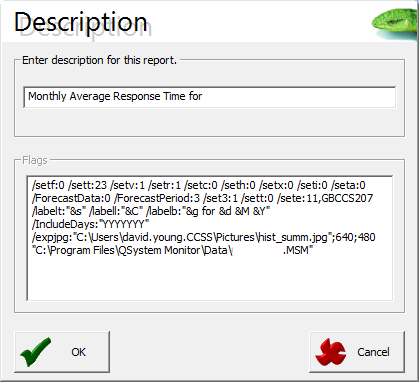 Use the parameter, Program/script, to run Report Generator, and the parameter, Add arguments, to specify which Report Generator report to run. 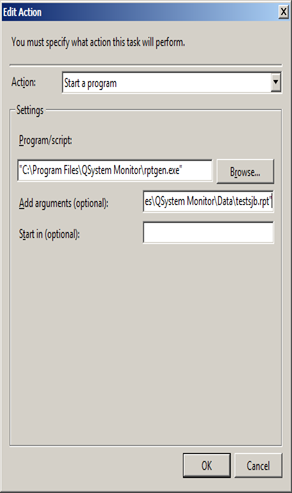 /r "C:\Program Files (x86)\QSystem Monitor\Data\testsjb.rpt"
When creating Report Generator reports, you can use variables in the file name.